I love these books posts, but I am mostly writing this one today because there’s a lot going on and I want to keep the blog consistent! Keep it simple – that’s one of my mantras this week. Edgar had a sleepover at his cousins’ house recently, and we sent some of his current favorite books with him as a comfort. I love that – the fact that books are a comfort. They certainly are for me. We had a last-minute overnight trip recently and I packed ten books. TEN! And I needed every single one of them. Caps For Sale by Esphyr Slobodkina. Edgar loves the silly monkeys who mimic the cap seller in this book. It’s a winner with me, too. Hug Machine by Scott Campbell. Edgar loved this book, eventually, but it started out as an obsession of mine. I purchased it as a gift for many of the toddlers I know, and reading it is such fun. Plus you get to give lots of hugs while you tell the story! Baby Present by Rachel Neumann. I can’t remember how we stumbled upon this book. It actually reads like a short meditation. The text starts like this: “Breathe in, baby. Breathe out. You are perfect just as you are, sitting in the here and now.” When I read it to Edgar, I feel like I am taking a moment for myself, a moment of meditation and quiet mind. Those moments are few and far between when you’re caught up in the chaos of parenting young children, so I have appreciated this book oh-so-much. Bringing The Outside In by Mary McKenna Siddals. A nature lover’s dream book! So sweet and lyrical. It follows a group of kids playing outside throughout the seasons, and uses rhyme and repetition beautifully. If You Give A Mouse A Cookie by Laura Joffe Numeroff. A classic! I love this book and its counterparts, If You Give A Pig A Pancake and If You Give A Moose A Muffin. Hairs by Sandra Cisneros. A children’s book by the author of The House On Mango Street! This is a beautiful and poetic book. I was actually surprised when Edgar started to love it so much! There are few trucks. The moon doesn’t make an appearance. For some reason, he just loved it. Edgar and I hope you enjoy! Edgar’s new favorite thing to do at bedtime is ask about what he’s going to dream about that night. I know. It’s too cute. I’m not even sure how it started. But now, his routine is three books, a song, and his dream telling. Whenever I mention bedtime, he says “Dream!” Then we talk about what he’s going to dream about – usually something connected to his day – and then I lay him down to sleep. These posts about Edgar’s books fall into a different category than most of my other blog posts. They are sort of becoming a scrapbook of little moments and memories from Edgar’s babyhood and toddlerhood, and I think blogs are great for that. They can be a way to capture these little magical moments in time. And for a non-scrapbooking mom like me, that is extremely valuable. Good Night Good Night Construction Site by Sherri Duskey Rinker. Really, anything and everything trucks worked for 18-month-old Edgar. Knuffle Bunny by Mo Willems. HOW CUTE IS THIS BOOK? I love it. If we’re going to read a plot-based children’s book, I want the plot the be simple and sweet. This one is. Edgar loves it so much. Corduroy by Don Freeman. This was one of the first plot-based books that Edgar liked. I loved it at this age because it had a plot, but wasn’t really long and verbose, so it suited his attention span well. The Snowy Day by Ezra Jack Keats. Edgar’s favorite part – and mine – is when the show drops on Peter’s head, PLOP! From Head To Toe by Eric Carle. It is so cute how much Edgar likes this book. It prompts kids, asking them to raise their shoulders, bend their neck, kick their legs, stomp their feet. I only wish I liked it, even a little bit. To this day, I will agree to read this book exactly one time before referring Edgar to his other mother for a second or third or twentieth reading. This summer, I crossed a few books off of my Slow Jams Syllabus. This was a list of books that were in my To Be Read pile for a long while. They survived many episodes of thinning out my book pile, and I can be pretty ruthless about getting rid of books that I know I’m not going to read. The thing was that I knew I wanted to read these books someday. I set an intention of making these Slow Jams a priority during my Summer Sabbatical. I mostly accomplished this by downloading the books via Audible and listening to them during my many road trips. 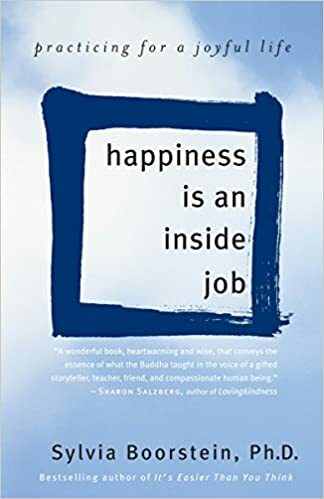 I often listen to podcasts (or, let’s be honest, toddler jams) on road trips, but I realized that one of the books – Happiness Is An Inside Job by Sylvia Boorstein – was only six hours long, audiobook-style. That’s one round trip to my mom’s house in New York. I’ve crossed only two books off of the list so far, but I’m planning to use my commute to work on many of the others. -This book is based largely on the Buddhist concepts of Wise Mind, Wise Effort, and Wise Concentration. I’ve really enjoyed reading more about Buddhism; one of my favorite books of all time is Buddhism Plain And Simple, by Steve Hagen. I’m going to read another book by Hagen to follow this one up since I am back in this groove. -That lofty word, equanimity. The definition, according to my internet search, is “mental calmness, composure, and evenness of temper, especially in a difficult situation.” There’s not supposed to be a goal when it comes to Buddhism and meditation, I don’t think – I think you’re just supposed to be, and accept your circumstances. But if the stillness, the meditation, and the acceptance bring equanimity – well, that sounds pretty great. Edgar loves books. This morning, as soon as I’d lifted him from his crib and set him on the floor of his bedroom, he wandered over to the pile of books on his nightstand. He selected A Traffic Jam Of Trucks (a long-time favorite), and asked “Read?” in his tiny toddler voice. Then he plopped down in my lap and we read the book together. Sometimes, Edgar will occupy himself, playing with cars or a guitar or his dollhouse, and I’ll be able to steal some time reading a novel on the couch nearby. And sometimes – THIS IS MY FAVORITE – Edgar will bring two children’s books over to me, and he’ll hand one to me and then sit down to look at the other one all by himself. Once I have him trained to bring me a novel instead of Corduroy, we will be all set. Here are some of Edgar’s favorites from when he was around a year old. Enjoy! Quick As A Cricket by Audrey Wood. I first read this book at Tamara’s parents’ home in North Carolina. I think of children’s books as either lyrical or plot-based. This one is lyrical and is so sweet and lullaby-ish. City Block by Christopher Franceschelli. This is a fold-out book about New York, featuring lots of transportation (an Edgar fave) and lots of city sights (a Kerriann fave). Cars And Trucks From A To Z by Richard Scarry. This tiny book full of cars and trucks (duh) and is really cute. Mr. Brown Can Moo, How About You? by Dr. Seuss. We first heard about this book from a friend, and Tamara loved it. It’s super fun. Where Is The Green Sheep? by Mem Fox. I really like Mem Fox’s books a lot. We’ve read a bunch and they have all been well-received by Edgar. Reading Makes You Feel Good by Todd Parr. ALL TODD PARR BOOKS. I have no idea why kids love them so much. Edgar has loved every single one. Maybe the bright colors? Maybe the simple words? In this particular book, there’s a page with a bookmobile on it, so Edgar would eagerly turn the pages until we arrived at the bus of books, the ultimate payoff.